Camping opportunities are available for currently enrolled students only (not the general public) on weekends at designated campsites on Reinhardt University’s beautiful and scenic campus. The campsites are "primitive" in design thus electricity or running water are not available at the campsites. Each campsite has a tent pad, fire ring and a picnic table. There are extra responsibilities and skills that are necessary for camping on campus. It is your responsibility to know these before you go camping. 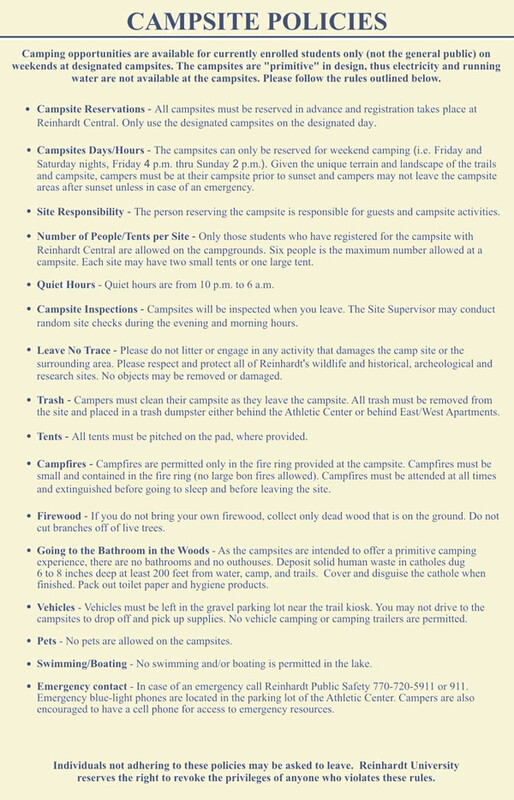 All users of the campsites must comply with the following camping policies and comply with the campus policies found in the Code of Conduct. Failure to abide by these policies may result in the revocation of any future camping privileges. Violations of the Code of Conduct will be referred to the Dean of Students. Camping policies and procedures apply to make your experience safe, and to keep the natural resources scenic and unspoiled for other campers. Campsites must be reserved in advance and registration takes place at Reinhardt Central. Campsites are reserved on a first-come first-served basis. The campsites can only be reserved for weekend camping (i.e. Friday and Saturday nights, Friday 4pm thru Sunday 2pm). Click here to download the camping reservation form. Click here to download the campsite policies. 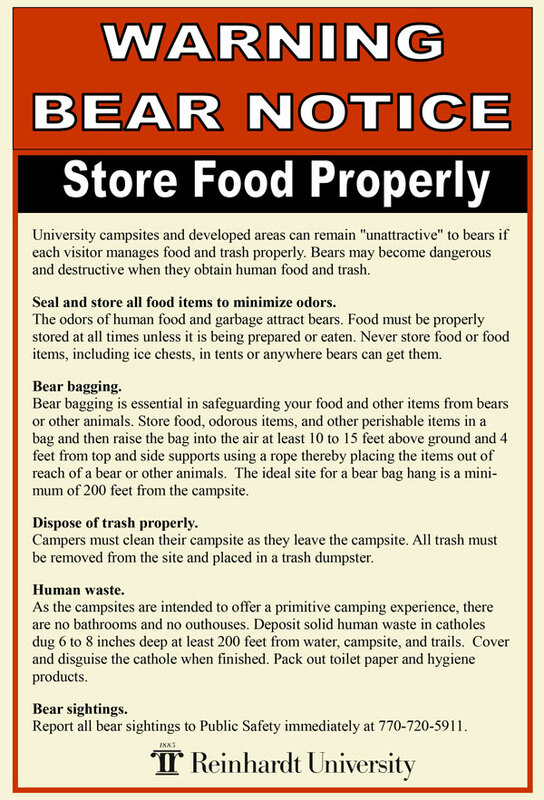 Click here to download the bear warning.